Although Edinburgh is a small city, there are a huge number of things to do. If you’re only here for a few days, here are my top ten things you have to do! Edinburgh is internationally famous for its Castle built on a crag of volcanic dolomite rock at the top of the Royal Mile and overlooking the whole city. Go before 1pm and get a good view of the ‘One O’Clock Gun’ which fires every day except Sunday. See the Scottish Crown Jewels, the beautiful chapel, the huge Mons Meg cannon and much more. If you are here during the festival (August) you may be able to catch the Edinburgh Military Tattoo on the Esplanade. Edinburgh has about 6 tour companies who do history and ghost walks of the city – but they vary in quality. My advice would be to avoid the free tours – they don’t go anywhere you can’t go on your own and will waste a few hours of your day! If you do decide to take a free tour, check your guides credentials early – see if they really know about the city or are just going to feed you a script! The other tours are all good – Auld Reekie, Mercat Tours, City of the Dead, Mary Kings Close, The Witchery Tours – you won’t be disappointed with any of them! City of the Dead is, of course, the scariest by far! Disclaimer: I user to work for City of the Dead (tell them Lesault sent you! ), these views are mine and not necessarily those of City of the Dead! A beautiful Highland Landscape only a few minutes walk from the centre if Edinburgh. A climb to the top isn’t too hard (if I can make it, anyone can!) Arthur’s Seat is another extinct volcano, it’s in the beautiful Holyrood park and gives an amazing view of the city. If you don’t fancy climbing all the way to the top, you can get similar views from the Salisbury Crags which are a good bit lower and a much easier walk. Also worth seeing is the ruined St Anthony’s Chapel perched above St Margaret’s Loch. Take a sandwich with you and enjoy the view of the city and the Firth of Forth to the north. If you’re after a bit more culture, you can’t beat the museum. The Story of Scotland’s land, people and culture. The adjoining Royal Museum is slowly being reopened bit by bit after its renovation and promises to be an amazing attraction in 2011 when it fully reopens. See Dolly the sheep (although, once you’ve seen one clone you’ve seen them all! ), Viking and Pictish artifacts and more modern exhibits like Jackie Stewart’s Formula 1 Car. If you like plants and the outdoors, you could easily spend a full day here looking at all the exotic plants. It’s free to get into, but it’s worth paying the small supplement to get into the Victorian Palm House and the other glasshouses which join onto it. There’s a petrified tree nearby which is really interesting and I especially liked the Chinese Hillside, although there are many themed areas to visit. A fantastic exhibition of Illusions and Holograms just outside Edinburgh Castle. One of the largest exhibitions of holograms in Europe – there is plenty to see on the way up the stairs to the Camera Obscura which sits on top of the building and is a landmark in its own right. The Camera Obscura was the height of Victorian technology and has been entertaining visitors for over 150 years. A mirror and system of lenses project a moving image of edinburgh onto a round table in the centre of the room. You get a humorous and knowledgable guided tour of edinburgh without moving from your seat. Fabulous views of the castle, city and Forth. About 40 minutes by bus (Lothian #15) from Edinburgh. The Rosslyn Chapel has been made very famous recently by the Da Vinci Code book and film so it tends to be much busier now than it was a few years ago, but it is definately worth the trip. See how many ‘Green Man’ carvings you can count, and find the carvings of maize which prove America was visited by the Scots before Columbus! One of the best ways of seeing a lot of the city and to get from place to place is with a bus tour. The buses leave from Waverly Bridge near the train station. My advice it to choose one of the tours with a live guide rather than one with a prerecorded tour and headphones. The live guides know their stuff, are witty and can answer any questions you have. Check out which attractions each bus takes you to and choose the best one for you – you can get on and off the bus as often as you like in a 24 hour period and can go round the route as many times as you want. I still try to do one of these tours every year or so and always learn something new. A short bus journey out of the City Centre will take you to Edinburgh Zoo. Over 1000 animals, the Zoo specialises in rare and endangered species. The Budongo Trail lets you get really close to Chimpanzees, there is a penguin parade which is worth seeing. My tip is to see teh feeding of the Steller Sea Eagles – these are huge birds of prey and extremely impressive when in flight. The rhinos are huge too – see if you can catch them fighting! Open weekdays 12pm-4pm (with longer hours during the festival), this is the weirdest museum I have visited. It presents the history of surgery with emphasis on Edinburgh’s contribution. There is also an exhibition of sports medicine, a Sherlock Holmes exhibition, and a history of dentistry. But, my favourite part is the pathology museum – all sorts of diseased body parts in jars! Brilliant! Plan for about 2 hours to see all the exhibits. Ok, I said top-ten, but you’ll do this one anyway getting from place to place. Edinburgh’s Old Town is amazing – it’s the reason I like Edinburgh so much. 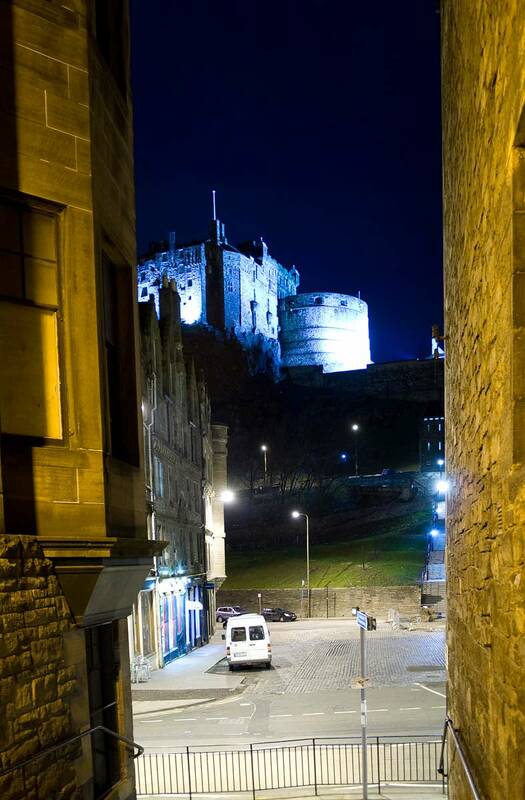 The main street, the Royal Mile, runs from the castle at the top, to the palace at the bottom. Many narrow ‘closes’ branch off from the main street and are worth exploring. Check out the views you get between the buildings, often you get a stunning view of Arthur’s Seat, or the New Town. I especially like how the Old Town is on so many levels with so many bridges.. go and explore! Trevor: Nice list. For me the Museum of Childhood is another "must see", probably because I'm a big kid! And it's free.